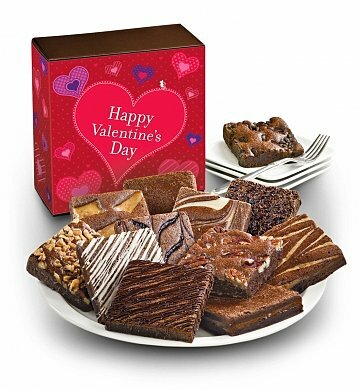 Valentine's Day is sure to be extra sweet with a dozen decadent brownies in twelve flavors, perfect for loved ones, teachers, kids or simply bringing to the office. Hand made from fine Callebaut Belgian chocolate and all natural ingredients, these brownies come in a variety of enticing flavors and arrive in a romantic gift box. Each premium brownie is individually wrapped for freshness and arranged in a perfect Valentine's Day-themed gift box. One Dozen Valentine's Day Brownies is a hand delivered gift. These gifts are delivered by one of our local design centers located throughout the United States and Canada. Same day delivery is available for most gifts when ordered before the cutoff time. The cutoff time for One Dozen Valentine's Day Brownies is in the recipient's time zone. I am thrilled to see the recipient compliment the gift and ask where they could find this company. "They are fantastic. I want to use them"
The content was large scrumptious brownies that were so tasty and beautiful. An amazing selection. Perfect for sharing or NOT!! !